xiv, 542 pages, illustrated, references, indexed. This is the most recent and largest of the Tesla biographies that has been produced to date. 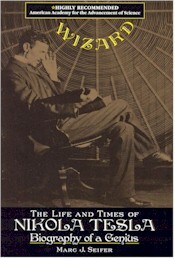 The author gives a wonderful overview of the social setting in which Tesla lived and of his contemporaries. The book will provide the reader an excellent sense of the breadth of Tesla's achievements. Nikola Tesla (1856-1943), credited by many as the inspiration for radio, robots, and even radar, has been called the patron saint of modern electricity. Yet very few people know about his life and work. Based on original source materials and previously unavailable documents, Wizard is the definitive biography of this founding father of modern technology. For the first time, Wizard reveals the details of Tesla's struggles with competing contemporary inventors such as Edison, Steinmetz, and Marconi and with financial giants like J. R Morgan and John Jacob Astor, underwriters of his work. An immaculately groomed figure, Tesla once lived at the Waldorf-Astoria in New York and dined at the finest restaurants. Tesla's genius was challenged, however, when his peers vilified his attempts to contact other planets. In the last years of his life, unable to secure financing for his newest inventions, he lived in semi poverty in a fourth-rate hotel. Wizard brings to the fore the intriguing life of this legendary innovator.